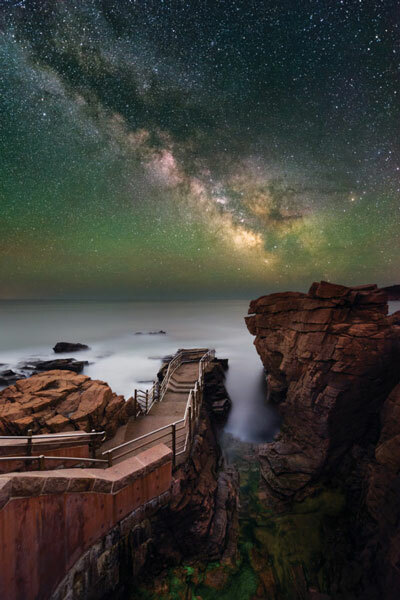 To find Acadia’s purest wilderness, just look up to behold the largest expanse of naturally dark sky east of the Mississippi. Find respite from the Bar Harbor crowds with a restorative trek across an ephemeral gravel land bridge (the town’s namesake) to lupine-strewn Bar Island. This chain of four evergreen-spiked islands in Frenchman Bay is a short paddle from the village of Bar Harbor. There’s something oh-so-inviting about a mountain pond, and few in Acadia are more picturesque than the little spring-fed kettle pond known as The Bowl. Suspended on pilings over the waters of Hadlock Cove, the seasonal Islesford Dock Restaurant counts MDI summer resident Martha Stewart among its fans. The park’s 45 miles of idyllic carriage roads are the best examples of broken-stone roadways in the country. 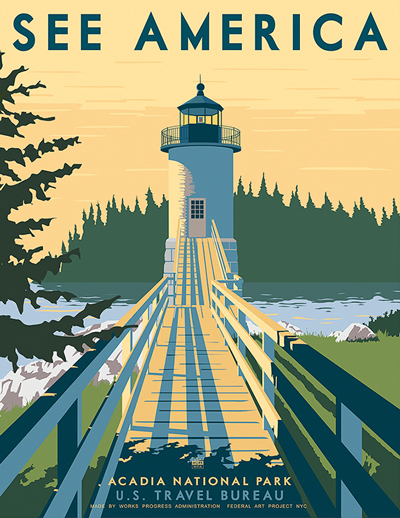 Acadia puts an extra rugged spin on the iconic Maine postcard view of the lit tower standing stoically against the shore. Throw your lighthouse expectations out the window: those in and near the park are all a bit quirky in location and/or design. From the article “Acadia National Park: Mountain Playground by the Sea” by Herbert J. Seligmann in our August 1959 issue. Rainy day fun, learning escapes, family activities, and more: a few (okay, more than a few) things to do when you’re not hiking or eating popovers.